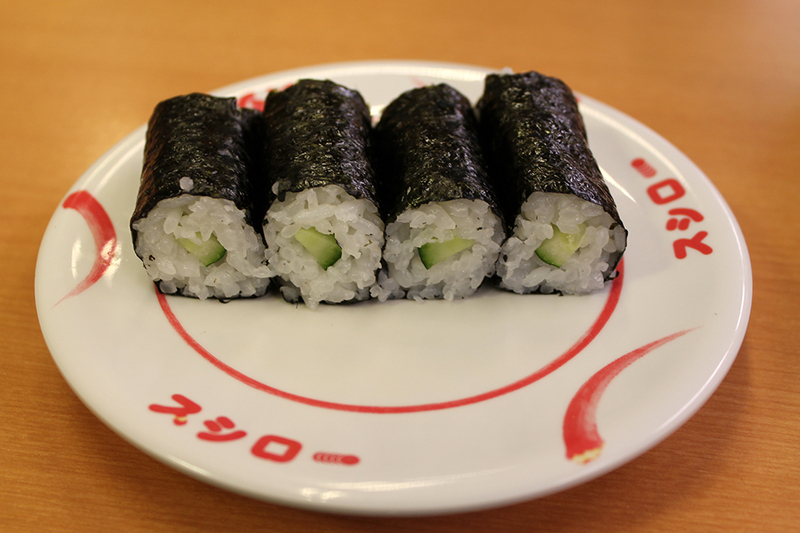 In the past I’ve had students ask me what kaitenzushi was in English, and I usually told them conveyor belt sushi. However the more I think about it, the more I feel that that is just an extremely unappealing name. 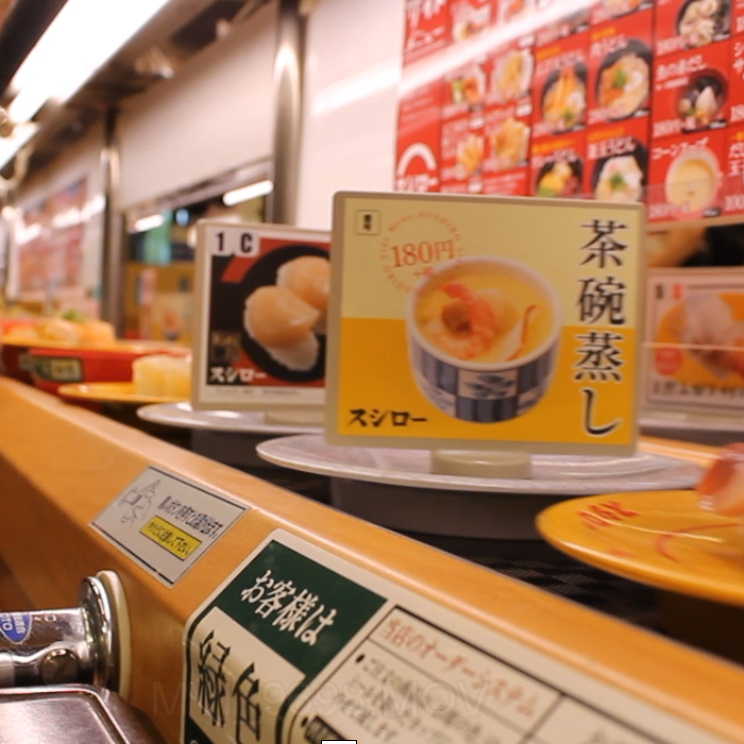 Apparently in Australia it’s called sushi train, which is definitely a better name. I personally vote for sushi merry-go-round or sushi parade because how fun does that sound? How could someone not want to see all the sushi on parade? 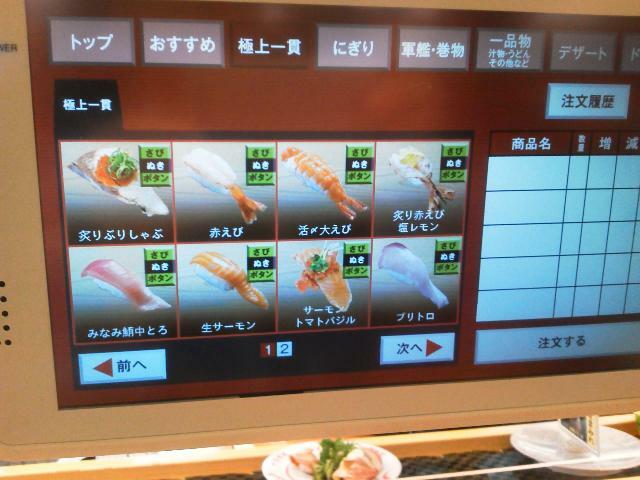 One of the cool things about Sushiro was that pretty much everything was automated. 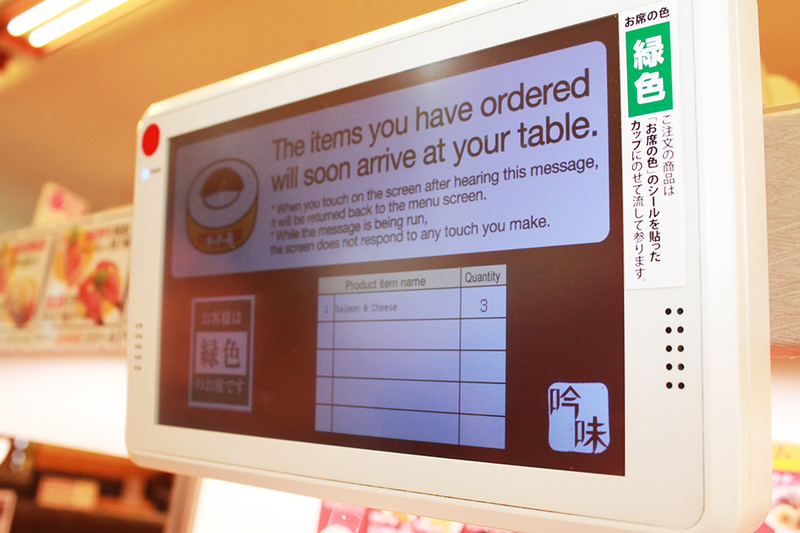 Once we were seated, our touch screen panel was just waiting for us to order. You can order a few things at a time, instead of everything you want all at once, and there are little photos so even if you can’t read what it says, you can get a good idea of what they have. 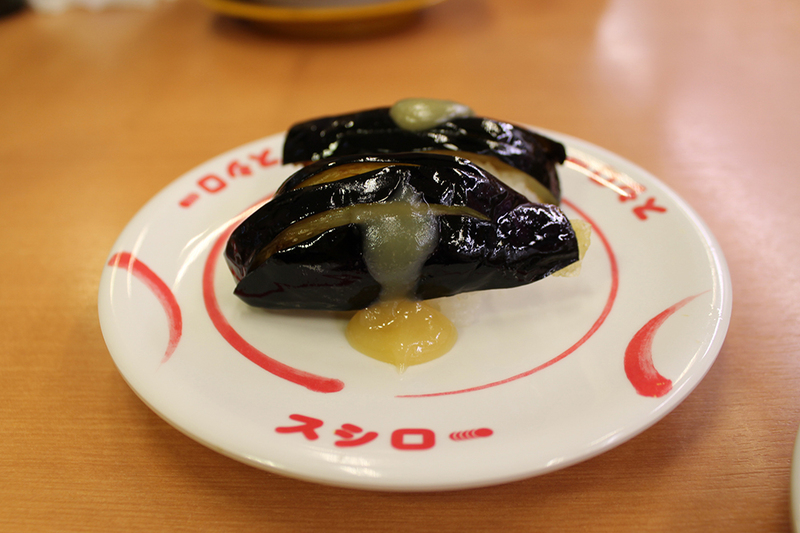 Most of the dishes were 105 yen, but there are some that are a bit more expensive. 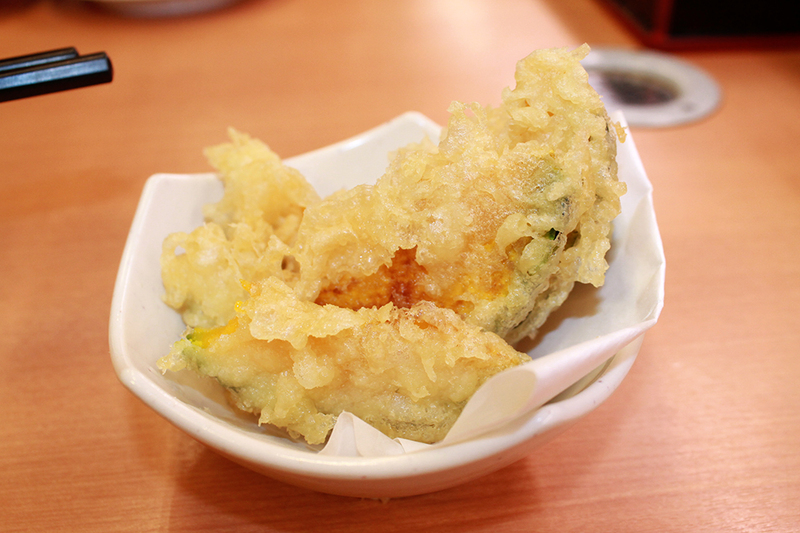 Aside from all sorts of sushi, you can order side dishes like tempura, french fries, fried chicken, udon, and salad as well as some pretty delicious desserts. After you’ve placed your order all you have to do is wait for the food to come to you. Each table has a specific colour – we were green. If you’re too enthralled with conversation and aren’t paying attention to the sushi parade, don’t worry. A little song and announcement that your items are soon approaching will be played by your mechanical waitress. When your food comes by pick up the dish not the coloured plate. I’m not sure what would happen if you missed your order, but I assume it would just take another trip around the track. Make sure you’re not taking someone else’s food, that’s just rude. 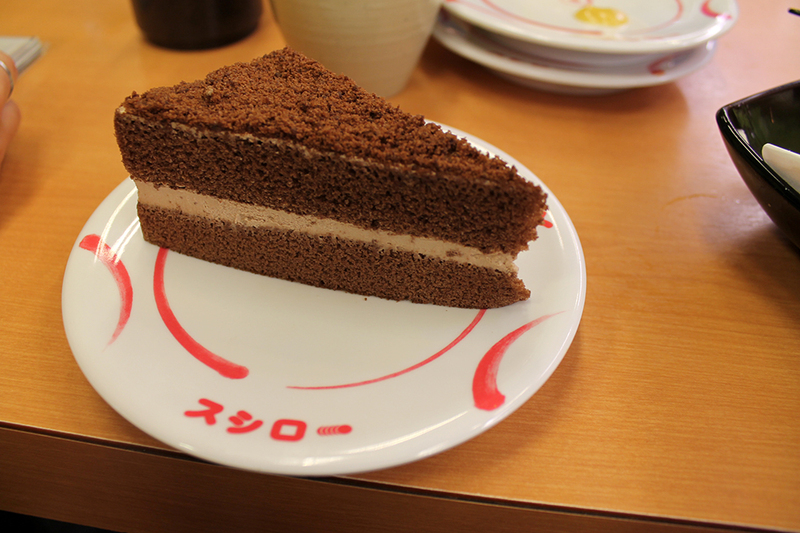 Aside from ordered plates you will see little advertisements and free-for-all dishes making their way around. If you see a plate that’s not colour coded that looks good, pick it up and make it yours. To be totally honest, at first I was at a loss on how they would know how much we’ve eaten. How could they keep track of both what you ordered on screen, and what you picked up off the belt? 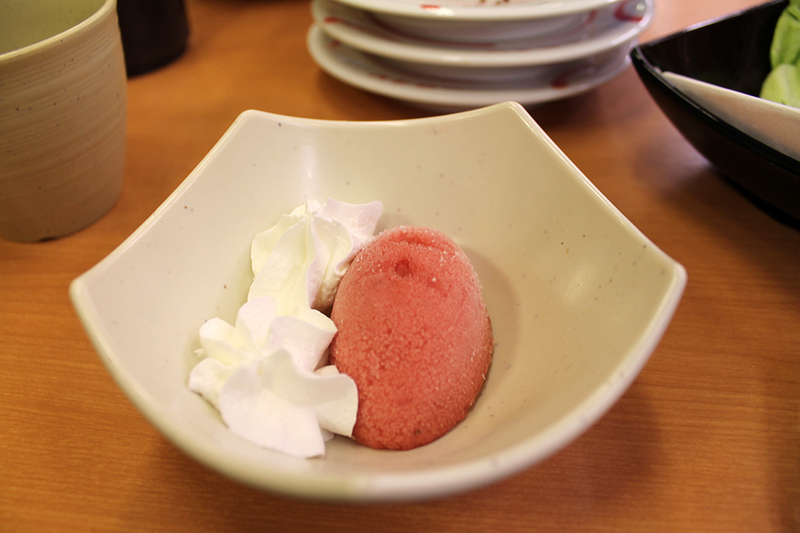 Most of the dishes cost the same amount, and anything that isn’t 105 yen is either on a differently coloured plate, or in a bowl. You’re supposed to stack your plates as you go, and not return empty ones. So when you’re ready to leave, call for a staff member. They’ll come over with a ruler and measure your stack of plates to figure out how much you owe. Don’t worry, they’ll also take into account the other plates and bowls you have. 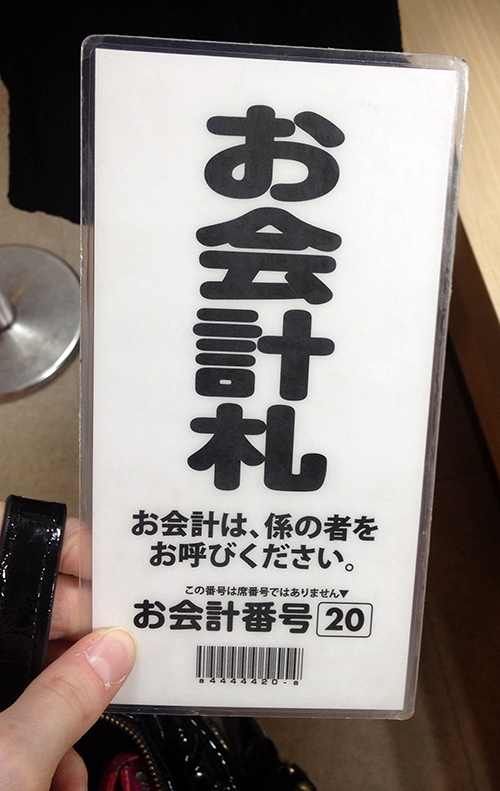 They then give you a card to take up to the cashier. I have to admit, the card is kind of comically large. The restaurant has a drink menu, but there’s hot water and matcha (green tea) mix that you can use that’s free of charge. I was definitely impressed that the spout was right there at the table, but man was it hard to push! There is also an array of condiments available for everyone to use. Now you’re probably wondering, since I don’t eat seafood, what did I eat at a sushi restaurant? 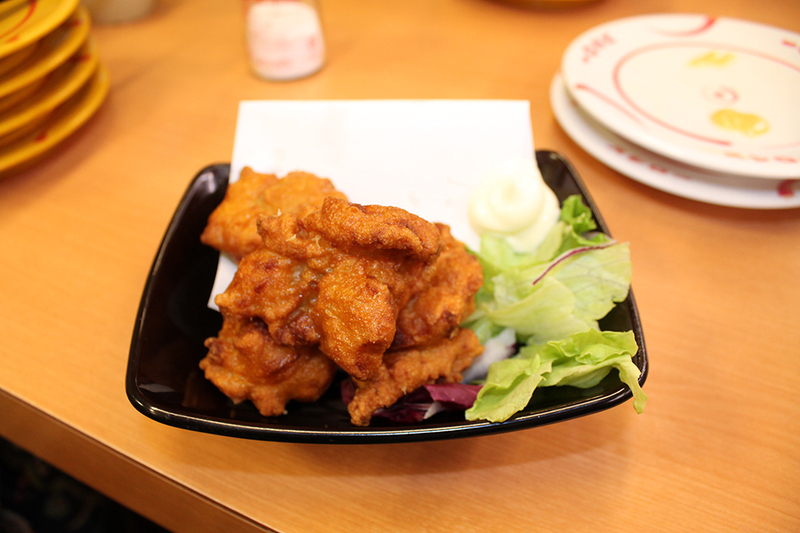 There are also a few dishes that have beef and pork, but I didn’t have any that day. 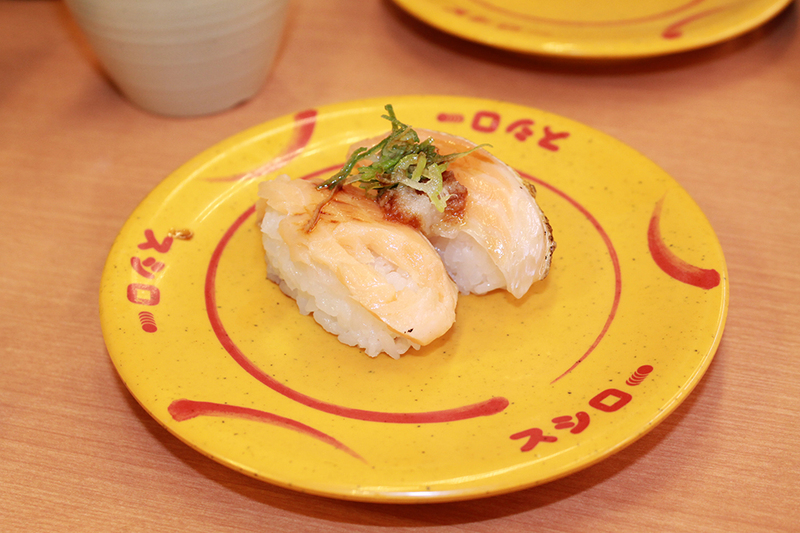 I had a great time going to watch the sushi parade, and whether or not you’re keen on seafood, it’s a really fun experience. BECAUSE I DIDN’T WANT YOU TO DIE FROM OLD SMELLY FISH. YOU’RE WELCOME. HOW CAN IT BE OLD AND SMELLY FROM A PLACE WITH A REPUTABLE NAME LIKE SUSHI-GO-ROUND? THAT’S ONLY A DISGUISE! IT’S TO LURE YOU INTO A FALSE SENSE OF SECURITY. I vote for sushi merry-go-round. It sounds too happy to not give it a try!